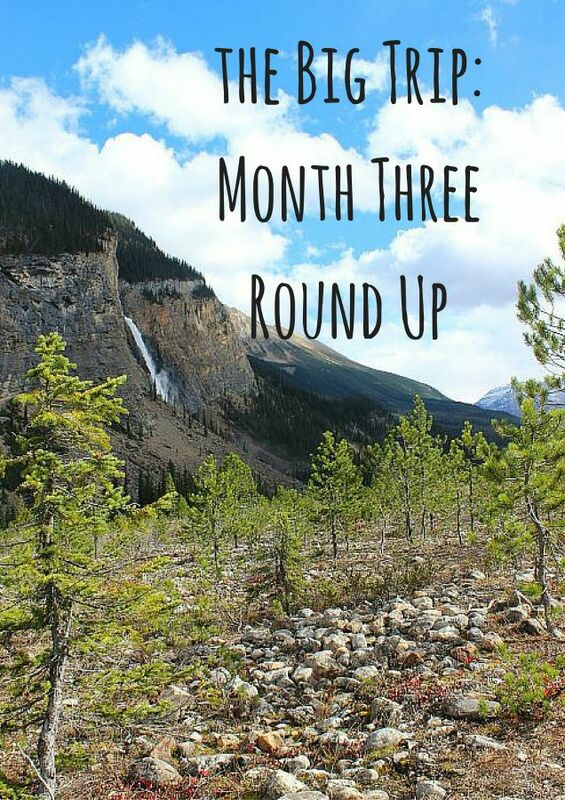 This month has been quite different from the previous two as I have been living in one place, the tiny town of Field in Yoho National Park which is part of the Canadian Rocky Mountains. I have been doing a Help Exchange placement, working at the small Fireweed Hostel and Mount Stephen Guesthouse three days per week for eight hours per day. I mainly clean the hostel and rooms/suites but also check people in, answer questions etc. I even did a bit of weeding and lawn mowing when it wasn’t raining. In exchange for working I get a room in a lovely two bedroom house with wifi and cable TV. Unlike a lot of other Help X placements, unfortunately this one doesn’t include food but I did a massive shop in Golden, the nearest town to Field, in my first week here and the food has pretty much lasted the whole time. I have just done a couple of small shops at nearby Lake Louise for fresh food since then. I have had a lot of down time over the past month and have spent far too many days indoors watching Netflix as the weather has been pretty bad but I did also manage to get out hiking on twelve different occasions in both Yoho and nearby Banff National Parks. I also did a couple of trips into the big smoke of Golden to shop and eat Tim Hortons donuts, and have had a couple of big drinking nights and delicious dinners at the excellent Truffle Pigs which is the only Restaurant in Field. It’s been a pretty slow month but living in the mountains has been something I have always wanted to try. Maybe Field is a bit too small for me but I would definitely consider living in the mountains again, just not somewhere with a population of 200. Best meal: I haven’t been eating out much this month but I have made it to the only Restaurant in Field, Truffle Pigs, a few times. Their Pork Belly Nachos in a bulgogi sauce is to die for and is definitely the best thing I have eaten this month. Worst meal: I’ve been cooking most nights and eating really well but the worst thing I probably ate was some pierogi with what ended up being slightly off greek yoghurt. It tasted fine but gave me a mild case of food poisoning the next day. Best craft beer: Truffle Pigs Ginger beer hands down. They make their own ginger pulp and add it to the local Kolsch on tap. So damn good! I haven’t met as many people this month as I did the first two months as the stationary life isn’t as conducive to meeting people. The one person who does stand out of the few people I did meet is my friend Paulina. I first met Paulina on my second day in Field as she also works at the Fireweed Hostel and she trained me. Originally from Santiago in Chile, Paulina was a high flying Lawyer at home until she felt like she needed a change and moved to Canada despite barely speaking English. She has been living at Emerald Lake where she met her Irish husband Darren for two years now and I really admire her courage to do something that scared her and that was so different to her previous reality. She is one of the main reasons I will miss living in Field. Reading: I thought that by living in tiny Field for the month that I would be reading hundreds of books but I have only managed to read three books this month (What I did manage to do was watch two seasons of Brooklyn Nine Nine and Friday Night Lights though). My favourite book was Baggage by Emily Barr. It is about a women on the run who gets a fake passport and escapes to a small backwater in the Australian Outback while awaiting trial. She was to be charged for the murder of four people who died after taking drugs that she supplied them. It was well written and exciting. I really enjoyed it. Even though it could be tedious at times as well as physically exhausting, I actually really enjoyed my time working at the hostel, even the cleaning. The thing I like about cleaning is that you can just listen to your music on and get stuck in. You can also see the end result of your hard work which gave me a sense of gratification and the hostel is a beautiful place to work which definitely didn’t hurt. But my favourite part of the job was interacting with the guests. I would check them in, give them a tour of the hostel and help with hike planning. I met people from all over the world of all different ages and it was a lot of fun. Working at the hostel has further cemented in my mind that I would like to run my own Lodge/Hostel one day. I think I would be really good at it. One of the awesome things that happened when I decided at the last minute to come to the Rockies again was that a few friends had also decided to do the same thing. So I got to see familiar faces and even my brother, meetings that wouldn’t have happened if I stuck to my original plans. A new friend, Kathryn, who I met in Alaska was staying in Lake Louise so I drove over to pick her and a couple of her hostel friends up to explore around Moraine Lake for a day. A couple of weeks later my friends Anna and Roger who were me and Trav’s couch surfing hosts two years ago in Toronto had decided on a last minute Rockies trip and ended up staying with me for a couple of fun nights. Then my brother was flown to Canada to attend his G Adventures’ big conference and networking event (he is a tour guide for them) and managed to get 10 days off beforehand. He hasn’t been to Canada before and he also decided on the Rockies so I got to spend four days hiking with him. I was so lucky that it turned out so well. You wouldn’t think it for an outdoorsy mountain town but the residents of Field are cat lovers. There are still plenty of dogs here but it seems like everyone has a cat too and the cats are characters. My favourites are Apollo and Star. Apollo likes to talk to me and sometimes follows me home and Star likes to make herself at home at the hostel and in Truffle Pigs and is super cuddly. All the cats I have seen around town are pretty friendly and are always keen for a bit of love. A town that loves cats is alright by me. So I did get to see Grizzlies in the wild when I was in Denali during the first month of my trip but that was from a shuttle with some of them being pretty far away. I had a more up close and personal encounter when I was hiking back from Sentinel Pass with my brother a week ago. We were hiking back down to Moraine Lake from the pass in front of another couple that we had hiked up with when we heard the girl shout out. We turned around and only 15-20 metres from us there was a massive grizzly bear ambling across the trail. We all kind of froze but it was obvious straight away that he wasn’t bothered by us as he lazily went on his way, across the trail and back into the forest. Very exciting! Although the weather in the Rockies while I have been here has been iffy, I still managed to do a lot of amazing hikes to thundering waterfalls, weird rock formations, brilliant yellow trees, colourful lakes and through miles of scented forest. I hiked in the rain, in the snow and under the blazing sun and I loved it all. Combined with my previous two visits to the Rockies I feel that I know this region and its mountain trails a lot better than most tourists that come through here. And that’s a privilege. I put this one in here because it honestly made my day. I never expected to get any tips cleaning so when I went in to clean one of the suites and there was a $20 note sitting on the kitchen counter for me, it was a great surprise. I also made a $10 tip one day too. Considering I am working in exchange for somewhere to stay rather than cash, every little bit helps. I haven’t made as many new friends over the past month as I did when I was on the road but the ones I have made, I hope will be lasting friendships as these friendships have had more than a couple of days to develop. Making local friends also made me feel more like a local myself which is always an amazing feeling and an experience you can only really have if you stay in one place for a while. I may have had to brave some early snow and freezing temperatures by being in the mountains at the end of summer and the beginning of fall, but it has been worth it to see the gorgeous colours as the seasons change. Bright yellow trees suddenly started to dot the forests and the undergrowth on hikes began to turn red. Seeing the larch needles change to a bright gold was particularly special as I didn’t know there were any conifers that did that. It is so beautiful in summer here but when the sun is shining, autumn is another level of beauty. Hiking to the Abbot Pass Hut could very well have been on the lowlights list but as we escaped unscathed, it is definitely a highlight. We knew the hike would be tough, especially the last section which is basically scrambling nearly vertical over loose boulders and scree to reach the hut, but we weren’t prepared for how tough it turned out to be. Getting up there was hard but I still loved it. Then a blizzard blew in overnight and I got scared. We were warm and comfortable in the hut but visiting the outhouse, the highest in Canada, was an ordeal in the -5C winds and blinding snow, especially as the hut is perched on a pass with sheer drop offs on each side. When we left the next morning the blizzard was still raging and we hiked the first 15 minutes in it before we got below it. Then we slid 400 metres on our bums through new snow and over sharp rocks in freezing temperatures. It was both exhilarating and terrifying. There were times when it was so steep that you couldn’t stop the slide and so you were basically careening uncontrolled down a mountain side. We were very lucky that we didn’t get hurt. It was one hell of an adventure! The weather has been seriously bad most of the time I have been here with days of smoky skies followed by what felt like endless rain and below average temperatures. The bad weather always seemed to fall on my days off too. Everyone was saying that summer came early with amazing weather in May and June. It’s a shame I wasn’t here then. As I said above, we had some really bad smoke from the multiple fires in Washington back in late August and the skies had an ominous orange glow for about five days. The sun was barely shining through the thick smoke and you could feel it in your lungs, leaving me with a sore throat and dry mouth. I actually welcomed the rain when it first started as it finally cleared the smoky haze and we could breathe properly again. Living in a small town with not a lot to do when you don’t know anyone, coupled with having a lot of free time and the weather being consistently bad is a recipe for boredom and loneliness. I love my alone time chilling out at home but usually for just a day at a time so when it is days on end, I tend to go pretty stir crazy. In a city when it’s raining you can go out for lunch, the movies, a museum – not so much here as the reason most people live here is for the outdoor pursuits. There really isn’t anything else to do. In the end I did a few hikes in the freezing rain because I just wanted to get out of the house so badly. I had too much down time without anyone to share it with. My flatmate for my first three and a half weeks was an incredibly quiet, shy, 19 year old from South Africa that had never spent any time away from home before. He was polite but completely uninterested in talking. He also had no interest in cleaning or emptying the rubbish, although at least he did his dishes. I found it such a downer living with him as I am such a social person and as hard as I tried to start conversations with him, he was just not interested. I was so happy when he moved out and my new flatmate Katja moved in. She is awesome and talkative and we get along great. I wish she had been here the whole time as it definitely would have helped with my loneliness too. The cheapest month so far but that is not surprising as I have been working hard and hibernating. There isn’t much to spend your money on around here anyway except food and booze so of course that is the highest expenditure for the month. The Abbot Pass Hut was the only place I spent a night in other than my cosy room in Field. I work in exchange for my accommodation so the hut was my only accommodation expense. Most of this was groceries but also a few beers and dinners at Truffle Pigs and Cilantro at Emerald Lake as well as lunches in Golden during shopping expeditions. Like I said last month, I wouldn’t be able to fit any more clothes in my bag but it’s not like there is anywhere to go shopping around here anyway. My main transport expenditure has been petrol for my boss’ truck when I borrowed it and for Paulina and my brother when they took me hiking. Also for the shuttle to Lake O’Hara. The furtherest I ventured this month was into Golden, 55km away, but most of the time I stayed pretty close to home. There is a parks pass in my boss’ van so I only had to pay park entry for the days when I was with my brother as he had a rental car. I had been thinking about going rafting but with the constant rain I changed my mind about that pretty quickly. Not much in the ‘Other’ department either, just a couple of small expenditures for our Abbot Pass adventure. The next month will see me back on the road again! I will be taking the overnight Greyhound to Vancouver where I will be spending a couple of nights before two more nights back in Seattle with friends. From Seattle I will be flying to Hawaii where I will be touring around Kauai for just over a week then it is homeward bound to Sydney where I am hoping to pick up some temping while catching up with Trav and friends. I’m really looking forward to being home for three weeks. I have missed Sydney more than I thought I would. Month three was definitely challenging at times but now I can say I have lived in a National Park in the Canadian Rockies. And that’s pretty special. I really appreciate your honesty with your time on the road. I’m happy to read about the not so sunny parts (literally and figuratively!) and also happy that you were able to hunker down and save some cash. It’s all part of the adventure! What an experience! You are certainly lucky to live in that part of the world for a while. I think the Canadian Rockies must be one of the prettiest places on the planet!